In celebration of Trey’s birthday, we want to do something special in honor of our son. 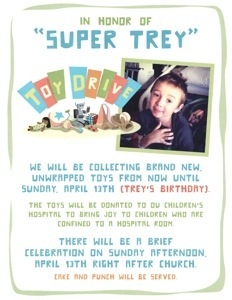 All the details are on the picture below, but for those who want to participate, please bring new “unwrapped” toys to FBC Newcastle between now and Sunday, April 13th (Trey’s physical birthday). You can also bring an unwrapped present with you to church on 13th if you would like. We will also be having a brief celebration immediately following the 10:45am worship service in the family life center on Sunday, April 13th. Whatever toys are collected (remember they need to be new and unwrapped) will be donated to the OU Children’s Hospital in Trey’s honor. Thank you in advance for helping us remember and honor our son.